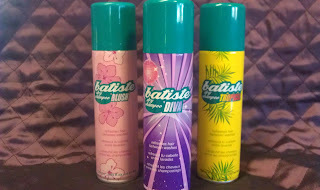 Aussie Beautiful: How batiste Saves My Life! Okay perhaps a little exaggeration however it does save me hours in washing and styling my hair. I have extremely oil hair and to keep it from looking greasy and lip I really need to wash it every morning, but then I found washing it and straightening it every day was absolutely destroying it. A friend suggested dry shampoo and I did the O_o crazy eyes at her then hit my local Priceline and picked up some Klorane dry shampoo which I thought was the bees knees, until I found batiste. Being unbiased until I've tried every similar product I can get my hands on I tried Fudge (not too bad, I rank it 3rd) and Tresemme (just don't). It comes in variety of different cans, but besides the scent they all do exactly the same thing.. which is to give my hair back its volume and make it look temporarily washed. My personal favorite is batiste Tropical only because I like my head smelling like a remote secluded tropical island aka Coconut. Don't be deterred if you are a brunette and after spraying your hair you glance in the mirror and you see you have become your grandmother, I've noticed recently that batiste are doing a dry shampoo specifically for brunette hair (I presume it's a slightly tinted powder). Dry shampoos are a really great product that really do keep your hair looking fantastic - find the one that is best for you! 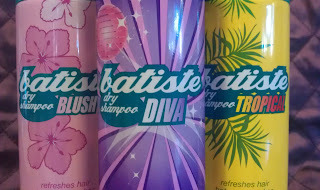 I love batiste! My fav scent is the tropical... Love!